Backed by the global leader in commercial laundry, Alliance Laundry Systems, ACE Commercial Laundry Equipment has the experience, knowledge and resources to offer unmatched finance solutions designed specifically for the Coin & OPL laundry industry. Whether you’re a seasoned investor or new store owner, purchasing new equipment or refinancing, Huebsch® Financial understands your business and cares about your goals. 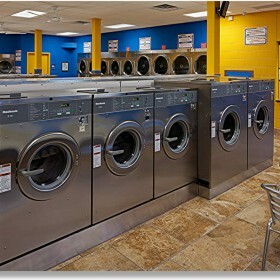 Whether you’re upgrading your current equipment or just getting in the coin laundry industry, we have a financial program designed to bring you the unmatched innovation of new Huebsch® equipment at a rate you can afford. Getting a pre-approval will allow you to budget for your upgrades & equipment purchases. Don’t let broken or old machines keep your location from reaching its full potential! If you’re interested in purchasing an existing Laundromat, we offer financing for up to 65% of the value of your target purchase. Plus, we can finance purchase existing locations with the purchase of NEW Huebsch® equipment as well. Whatever financial advice or assistance you need for your acquisitions, both ACE Commercial & Huebsch can help you through. It’s part of our dedication to building long-term, trusted relationships with our customers.